Preach it sister! Even if you are eating Snickers and Mountain Dew…you can still benefit from a green smoothie…get on board! Oh, so good!!!! My mother-in-law and I just watched together and I think I’ve convinced her to try her next smoothie with some greens! She’s daring and I practically swore to her that it doesn’t taste bad. Now I’m craving one! 🙂 Maybe with some carob/cocoa this time. I completely agree! I love the quote, too, because it’s true. Green smoothies are great for everyone, they’re delicious, and they’re easy to make. I’ve had several people email me this week wanting green smoothie recipes…if only it was this easy to convert people to Jesus!! What if you don’t have a 3 hp blender?? I can’t imagine my cheapie old blender ripping through dry greens like hers did! I’m afraid to try in case I break the thing! Caroline…I have a fairly “old” blender and most people don’t have Vitamix like she does in the video…but it IS possible to blend the greens. My method is to blend the water, banana, berries, etc. first and then when it’s smooth, add the greens (pushing them down into the mixture a bit) and then start slow and work up in speed. There are some greens you might want to cut first…kale has a hard stem that might get caught in a slower blender. But spinach is a super soft green (and mild tasting) green that will blend easily! Have fun! Sara–I’m all on board for smoothies, but the green smoothies are relatively new for me. 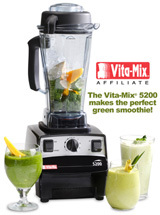 Question for you: Do you have to have a high-powered blender, such as vita-mix, to make green smoothies? I would love to start making them, but my blender is only so-so and I don’t really have an extra $200+ laying around to drop for a new blender. What tips might you have for adjustments to make a green smoothie in an average, run-of-the-mill blender? I also have a cheapo blender. For my two (so far) green smoothies, I have run all the greens, carrots, and (today) an apple in my food processor. Then I put the tiny chopped up veggies in my blender with water, banana add frozen berries. It blends up pretty quick, and I don’t have to keep either appliance running very long to get a smoothie. Now I am wondering if I can just pre chops tons and toss it in the freezer to throw in the daily smoothie. Thoughts on that?? What do the green smoothies taste like? Delicious smoothie!! I preefr the nice thick texture so this is perfect. I didn’t have any Vanilla Almond or Coconut milk and used cow’s milk instead. It does make it less sweet, but with a dollop of whipped cream on top, it’s wonderful. Great recipe and thanks for sharing!! I DID try the smoothie after Laurel let me come over and taste. Umm…yeah. Oh, girl. Those things taste good. And, B loved them! Actually, the woman in video used a BlendTec, not a Vitamix. They are different, I have not tried the BlendTec, but own a Vitamix 5200. Very satisfied, well worth the money. Buy a used one on Ebay. I would say it’s definitely worth saving up the money for either a Vitamix or Blendtec blender. Not only does it save the step of using a food processor, but the idea is to break the foods down to the smallest possible particles so the nutrients are absorbed more quickly and easily into your system. Much easier on the digestive system and you get the maximum benefit from all the good foods. You can see both “blenders” at http://www.eat-live.com. viewers, its really really fastidious piewce of writing onn buillding up new weblog. I really loved what you had to say, and moe than that, how you presented it. It is in fact possible to do more with less, you just have to know how to do it. from other writers and use something rom their sites. when choosing a product to promote are whether it’s a proven seller(look at the product’s gravity). The marketing mix represents the entire marketing process, which aids in getting you to your goals. Resolve the complexity and articulate user needs in clear-cut manner. piece of writing οn building up new blog. Sometimes you choose to spend all of your money on buying more powerful weapon, so you can defeat the enemy easer. that the player will have to make and each decision opens up a whole new path for the player to take. readers know exactly what to expect and where they can find what they would like to read. editing this content material. Again, thank you for your time as nicely as your efforts! web site, how can i subscribe for a weblog site? Very great post. I simply stumbled upon your weblog and wished to say that I’ve really loved surfing around your blog posts. In any case I will be subscribing to your feed and I’m hoping you write once more very soon! Good respond in return of this query with solid arguments and telling the whole thing about that. when new comments are added- checkbox and now each time a comment is added I get 4 emails with the exact same comment. радуют душу. Ваши фотографии выглядят фантастически!!! Hi there, for all time i used to check weblog posts here in the early hours in the daylight, because i enjoy to gain knowledge of more and more. just anyone get that kind of information in such an ideal means of writing? a quick visit this site, it contains useful Information. on the net. I will highly recommend this site! you simply made a few days in the past? Anyy certain? success you access persistently quickly. wanted to mention that I’ve really enjoyed surfing around your blog posts. After all I’ll be subscribing for your rss feed and I’m hoping you write once more soon! to pay for someone with experience. How much capable you are to produce a unique website for your client. opportunity, and relationship the internet site to a wonderful ideal domain. After you have passed your test, you can enrol on a Pass Plus course that takes you through 6 specially designed training sessions including:. you must apply for a provisional driving license. For those drivers that can’t act accordingly, the result can be terrifying. than take on a billion tons of angry saltwater with nothing but a piece of fibreglass-coated Styrofoam. This enables the practitioner to measure the electrical energy of the acupoint on a meter. as it could have been after on a time. This younger wife and older husband is getting increasingly in the last decade. with people’s increased interest in spirituality and ancient arts. Not only will you be capable to avail of the many advantages of yoga, you will also help save a considerable volume of income.